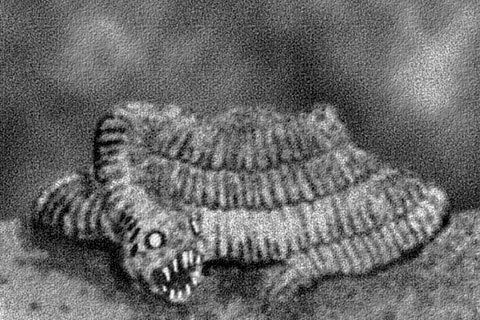 The Lambton Worm was an enormous, wormlike creature with large razor sharp teeth and huge glowing eyes. It was sometimes described as having spikes all along the length of its body. This creature terrorized villagers who, at one time offered large amounts of milk to appease it. This terrifying beast eventually outgrew the meager offerings and hungered for something more substantial such as local sheep and the villagers children. It didn't have any arms or legs but was often described as having many of the other combinations of reptilian and serpentine features as that of an old world dragon. It was said that after any attack, damaged areas would heal and severed parts of its body would make their way back to the beast, reattaching themselves to become like new. This mythical creature finally met its faith at the hands of John Lambton, who after several attempts took on the aide of a witch to terminate this beast once and for all by finally chopping it into just too many pieces for it to survive.